I really have to learn German. It’s a huge chunk of my DNA (like 75%), but somehow I just can’t get the hang of it. But I do love German food and Germany itself! Recently I discovered some ancestors who are probably among the first German immigrants on my tree. Their descendants eventually settled in “Pennsylvania Dutch” country. I’ve heard a rumor that some of them in that area still speak German to this day. Maybe I’ll move in with them and do an immersion language class. Think they’d mind? This is the story of Georg Tobias Paul and Eva Barbara Dockenwadel (I can’t read that without thinking “duck and waddle”). Both were born in Germany: Georg in 1737, Eva Barbara in 1735. They arrived separately and ended up in Philadelphia. How Georg came to America is unknown, but church records suggest he immigrated in 1753. Eva Barbara didn’t have enough money for her passage to America in 1754, so she signed a five-year indenture contract. In Philadelphia she lived with and worked for a furrier named A. Brechel. She attended the St. Michael’s Lutheran Church on 5th Street (now known as Old Zion Lutheran), one of earliest German Lutheran congregations in the country. She first appears in the pastor’s notes as attending a Pentecost service on May 27, 1756. The pastor took note of Eva’s status as a servant and recorded how long she’d been “in country,” her age, and the remaining time on her contract. After her five year’s indenture were complete, she left the Brechel home. She lived for a time with the Oswald family, then later with the Stanleys. For some reason, the pastor didn’t take a similar interest in Georg. Perhaps that is because he didn’t attend services until after he married Eva. They attended the Christmas service together in 1762, after their July 1 wedding that year. In 1763, Georg and Eva attended the Pentecost service together and were noted to be living with Georg Eppeles, who maintained a well-known inn on Race Street. The German Lutheran denomination was just getting established in America about 1740. Earlier German immigrants were Quakers, Mennonites, Dunkards, Moravians, and members of the German Reformed Church. Most Lutheran congregations had been established by lay preachers. A plea from colonists in Pennsylvania went out for a Lutheran missionary from Germany and the result was the arrival of Henry Melchior Muhlenberg in 1741. He’d been ordained just two years earlier. Muhlenberg was energetic and a dedicated organizer. He began his work as far south as Georgia and traveled as far north as New York. He took charge of German Lutheran Churches all up and down the coast, including the Philadelphia congregations. His ministry lasted 45 years. Though he wasn’t pastor at St. Michael’s-Old Zion when Eva Barbara and Georg Tobias began attending or during their marriage ceremony in 1762, he did serve as pastor from 1764 – 1767 and undoubtedly had a hand in training the other pastors. He also baptized two of their four sons. Georg Tobias and Eva Barbara’s sons were Martin (1763 – 1819), Valentine (1765 – 1823), Joh. Georg (1766 – 1767), and Joh. Michael (1768 – 1821). Michael is my 4th-great-grandfather. Unfortunately, we don’t currently have death records for George Tobias or Eva Barbara. Sons Valentine and Michael were confirmed at the Jerusalem Lutheran Church in West Salisbury, Northumberland County (now Lehigh County, Pennsylvania), in March 1784. The record notes that their father, G. Paul, is deceased. No mention of their mother, though. It’s possible that Eva Barbara had some Dockenwadel relatives in that area, so she may have left Philadelphia to be close to them after Georg died. The family remained strong in their Lutheran faith. Michael Paul helped found the Howerter’s Church at Line Mountain on the Lehigh/Schuylkill county line. In the fashion of their forbears, they kept good records, which makes it so much easier for those of us tracing our German roots. Somewhere, someday, I’m sure we’ll find records telling us what happened to Georg Tobias Paul and Eva Barbara Dockenwadel. Much of the research done on the Paul family has been compiled by my (distant) cousin, who goes by the moniker “Andrew Jackson Powell” online. I’ve drawn from his narratives on Georg Tobias Paul, Eva Barbara Dockenwadel, and Michael Paul. Well I hope you had a nice 6weeks off while we did all the work around here…Nice to have you back and another interesting history. It has been nice, but I’ve been itching to get back to the blog, too. I’ve missed the interaction. Looking forward to reading all my dear friends again. The Amish speak a colloquial iteration of German. They switch back and forth sometimes, between English and German when in public. Big thank you to you and your cousin “Andrew Jackson Powell” for this historical piece! Thorough and engrossing, as per usual. Thanks for stopping by! Yes, I figure American “German” would be of limited usefulness in Europe. I imagine it’s like the French Canadians in that they are speaking a more retrofitted language that is STILL that language. I’m fascinated with how languages change according to the geography. I’ve heard that in pockets of Appalachia that Elizabethan English persisted for centuries. I can’t promise you it’s true, but I heard it from a history teacher. So it’s at least somewhat probable. I accept this reputable source, no questions asked. Because I love the possibility of such a thing as that. Glad to see you back! Another interesting read, which always leaves me with more questions, as I’m sure it does you too! Love to know more about why a single woman in the 1700’s chose to come to the new land, and what her life was like indentured to A. Brechel. Yeah, I never can learn enough to really satisfy myself either! Love these stories of our ancestors! Yay, so nice to read another of your intriguing historical posts, welcome back, Eilene! Thanks, Irene! It’s good to be back. I’ll be looking for new recipes from you. 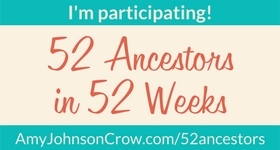 Oh good, you have another 52 ancestors to tell us about! I have to give credit to the even more serious researcher, though. I’m riding his coattails here. Good to see you back! I feel the same about Polish – I’m probably around 75% Polish, and my grandparents spoke it fluently, but I never picked up much more than dupa, pierogi, and paczki, though I suppose at least I know how to cook the two foods out of that group! Think I’ve been away as long as you, so we return together! I’ll be looking for new work from you then, too! Happy New Year.